The truth is that career-focused lessons get short shrift in our program. In a school where instructional time always feels limited, the schedule is crazy, and we are in dire need of raising test scores, teachers are invested in our lessons a gazillion times more when they can see a direct connection between our lessons and a) students being better learners, b) students behaving better, or c) teachers’ lives being easier. While there is certainly an argument for career lessons still having an impact in those arenas, its less direct and so it’s not a focus for our school. That said – we still want to do some career development work! We had previously done career weeks (dress up theme days, morning meeting plans) and a big career day with speakers for the upper grades, but last year we decided that we needed to up our game with “the littles”. Enter: Jobs on Wheels. This is such a great event – thank you FB elementary counselor page for the idea! 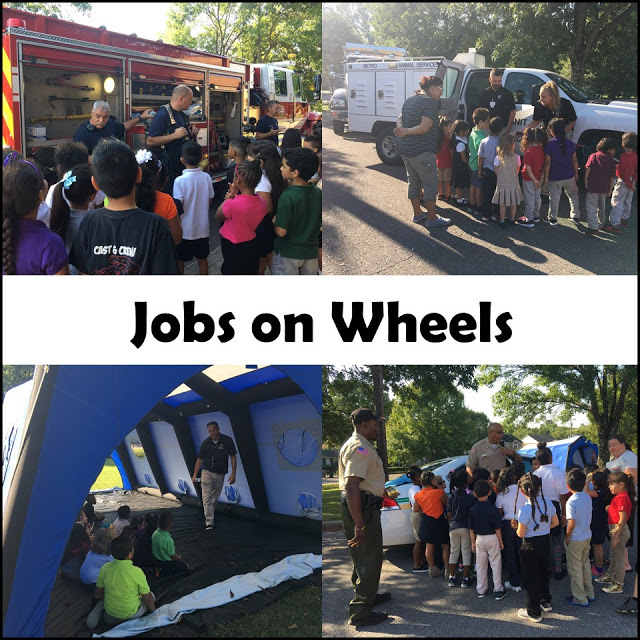 We pick a day in the fall (career day is in the spring) that aligns closely to when our younger grades do their community helpers unit. About a month before, we start contacting any company we can think of that uses a vehicle as an important part of their career. Our best luck has been through our local city government – we had a much better response rate from these kind folks! The email/phone contact with prospective professionals is a little work on the back end, but once everything is scheduled, it’s a pretty simple gig. No paperwork, no copies to be made, etc. Our students love the event…and so do the teachers which we think is pretty great. We’ve also found that any individual who is willing to come out to this event already has a heart for children and they’ve all been great with our students (including out low-incidence disability preK class). Because each group is at each vehicle for such a short amount of time, the people don’t need to prepare anything more than a few sentences on what they do. The children take it from there! What we would love to have in the future: rental services delivery vehicle (wedding supplies, bounce houses, whatever), Best Buy’s Bug Squad, and a food truck.